I find that I can't decide whether I 'buy-in' to Mother's Day. I don't need to be given some expensive flowers or taken for a meal in a very busy restaurant surrounded by other Mums to know that my children love me. I resent the idea of our precious family funds being spent on random gifts for me just because retailers tell my husband he should. As a Mum, appreciation can be pretty thin on the ground and now I'm no longer working the days can feel pretty relentless. So selling me a day where I can relax, put my feet up and open a lovingly-picked gift could actually go down quite well. A special day, a special gift or flowers to say 'thank you'. And when it comes to gifts, there are some on my Pinterest boards that I've had my eye on for some time... If money was no object! 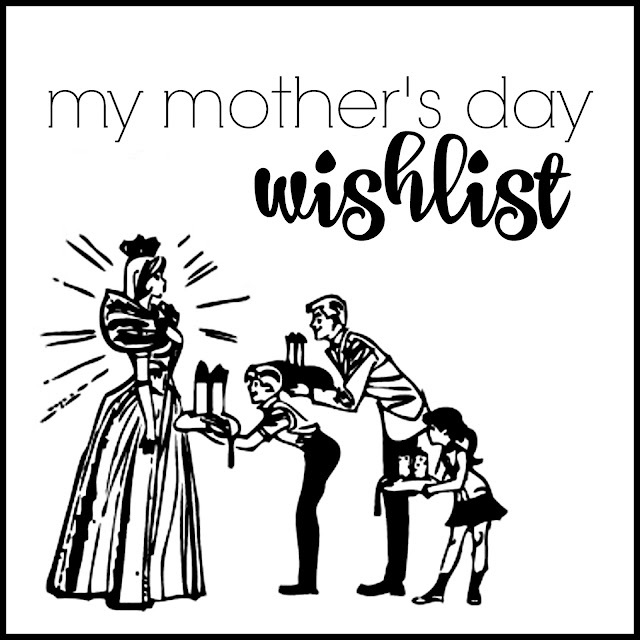 So, if you're looking for some ideas (or you're my husband, have secretly come into some cash and would like to push the boat out this Mother's Day) here is what is on my wish list. 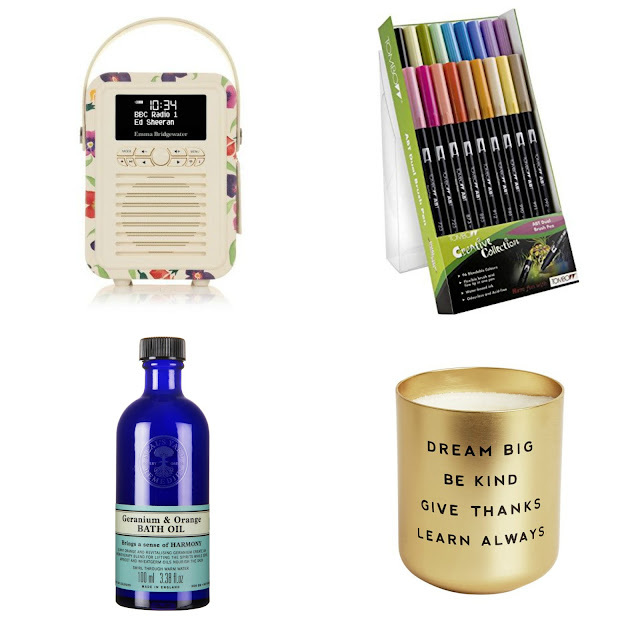 How cute is the Emma Bridgewater Wallflower print on this Mini Radio and Bluetooth speaker from VQ? I've recently decided that I need to sing in the shower instead of over-thinking things and dwelling on bad dreams. Now I'm working on convincing Matt that this is the perfect accessory for giving me a more positive start to my days! I love to get out my colouring book and relax in the evenings and have recently bought some of these Tombow pens as individuals. I've been impressed by the quality and range of colours in this set from Curtis Ward so it's pretty high up on my wish list. Want to know what the sunrise looked like on the day you became a Mum? or on your very first Mother's Day? I came across this amazing company at The Baby Show a few years ago and have wanted one of these prints ever since. When it comes to amazing bath products I've been a fan of Neal's Yard for some time now. Their products always smell heavenly and this Geranium and Orange Bath Oil is perfect for a relaxing and uplifting bath treat. As well as stunning stationery, I've fallen in love with the beautiful homewares from Kikki K. Who doesn't like an inspiring quote on the side of a candle?! 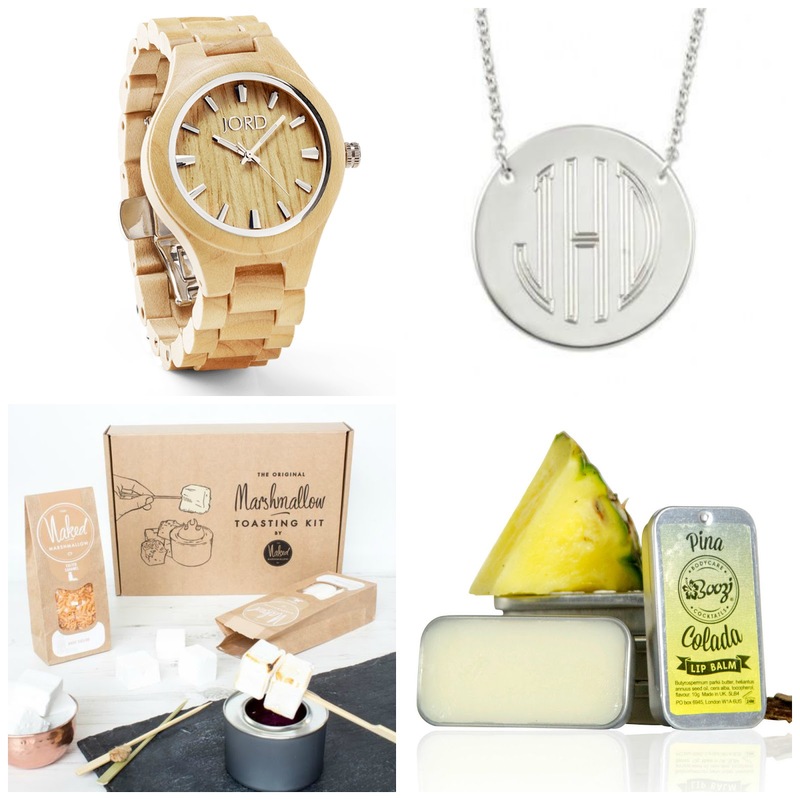 I'll admit to having a bit of blogger envy when I spot the lucky ladies in my instagram feed with these stunning wooden watches. I can't usually wear big watches but I love the styling of these. I can't believe they're made of wood and yet look so fashionable and durable. They also ship worldwide from the US which is good to know as I hate finding amazing items on the internet and then having to face huge shipping fees. A childhood friend has recently become a Hostess for Stella and Dot and when she shared a pic of her beautifully personalised necklace she had me hooked. I love how simple the disc is and yet there are so many different ways to make it your own. This is genius. Just genius. Toasted marshmallows always make me think back to fun summer evenings around a Lion Rampant campfire - singing a dreadful rendition of Filthy Vikings, drinking mead and eating loads of hot marshmallows. This kit from The Naked Marshmallow Company might not be quite the same but the marshmallow flavours sound divine and with the handy gel burner you can have them anywhere. That's good enough for me. It may be a bit naff but I do love a Pina Colada cocktail! Tropical flavours, creamy coconut, rum... It could almost make up for not having a holiday abroad since my honeymoon. And in the absence of any alcohol, I'd more than happily settle for this amazing lip butter from Boozi Bodycare. Really, all I want for Mother's Day is a really long lie in, some nice cards and a roast beef dinner with loads of Yorkshire puddings. A bunch of daffodils would be nice. And a house that stays clean and tidy long enough for me to take an instagram photo.